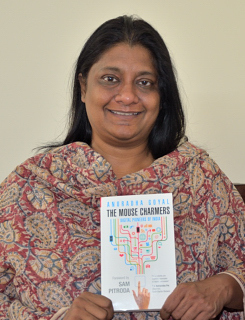 Today, I am glad to introduce the first author from the prestigious Random House Publication India – Anuradha Goyal. AG:I was born in Punjab, grew up in many different cities and continue to move between cities. Studied Physics for graduation, computers for master’s degree at Panjab University, worked in IT industry for about dozen years before the writing took over and became my identity. AG:I have been regularly blogging for a decade now, on three topics – Business Innovation, Travel and Book Reviews. I think because of longevity and regularity, the blogs get rates amongst the best in their categories. I have published papers in business journals, co-authored India Innovates series published by CII, written travel story for an anthology and conducted workshops on Creativity & Innovation, Travel Writing & Book Reviews. I regularly write for print publications including a column for a lifestyle magazine. I also speak at various conferences and seminars on all the subjects mentioned above. AG: It happened as a natural progression after I had written quite a bit for India Innovates series. BNI: A 30 word tagline for your book. AG: Stories of Pioneering Indian Digital businesses, that give you insights into what goes into making a business successful in a highly dynamic and evolving business environment – after you are already inspired to take the plunge into entrepreneurship. AG: It is inspired from a quote that said ‘ India used to be known as country of Snake Charmers and now it is known as country of Mouse Charmers’ – from the time I heard it – I could not think of any alternate title of the book. Fortunately, publishers also liked it, so we never discussed any other title for the book. AG: First audience is the startup entrepreneurs, aspiring entrepreneur, business students and managers. I guess anyone who has interacted with the companies mentioned in this books would like to read behind the scene stories of the digital platforms that they use on a day to day basis. BNI: Is there a message in your book/novel that you want readers to grasp? One, if these young men and women from middle class backgrounds could create billion dollar businesses in a space that did not exist till few years back – even you can. Second, I want to be prepared for the challenges ahead and realize that what looks very simple on the front-end can be quite a lot of hard and smart work at the back end on a constant basis. It is easier to build a company than to scale it up, and it is easy to scale it up than to maintain it at the top. However, I also believe that each user picks up his or her own message from the book. BNI: Do you meet your readers at book signings, conventions or similar events? Any plans in relation to this book? AG: I plan to, as and when the opportunity presents itself. I would love to interact with a live audience and talk about my interactions with these and many other companies I have written about. BNI: When and how did you decide to become a writer? Do you write full-time or part- time? AG: Writing happened to me about 10 years back. I was always a voracious reader and my house has always been full of books but writing took time to come, but when it came, it consumed me completely. AG: Mahabharata remains an ultimate book for me. You can read any number of times from as many angles and always learn something new about the story you know since you were in school. AG: I read across genres – management to mythology, physics to metaphysics, psychology to philosophy and of course the regular fiction and non-fiction. These days I particularly enjoy biographies – both personal and business. BNI: According to you, What is the hardest thing about writing? AG: Maintaining a discipline to write regularly. If you are able to do that and if you naturally enjoy writing, it usually happens effortlessly. BNI: What has been the toughest criticism and best compliment to you, as an author? AG: Yet to come, but Sam Pitroda who graciously wrote the foreword for the book sent me an e-mail praising the book and the need for the book for all management and technology students, that I would cherish for a long time. BNI: What will be your one favourite tip to get through the writer’s block. AG: Write regularly, even if it is not the best of your writing. Every successful writer has a writing routine. AG: Series are good if readers like them and if author has the genuine material for the same. For this book, it all depends on the reader response. BNI: Can you tell us about your challenges in getting your first book published? AG: I have no author struggle story. Publishers were too kind and friendly to me, and I hope now readers would do the same. BNI: What was your favourite chapter (or part) to write and why? AG: 12 businesses featured in this book have been chosen out of 100s I had in my list. So each of them is my favorite for a reason that is highlighted in the story and you would see it as you read the stories. BNI: Did you learn anything from writing your book? What was it? AG: Every interaction with these brilliant innovative entrepreneurs was a big learning for me. I admire each of them far more than I did when I started working on this book. BNI: What are your expectations for the book? AG: I hope it inspires more youngsters in the country to create more businesses, more employment and more self-sustenance for the country. AG: I guess so – it’s like the first impression – that always leaves a mark. AG: Printed Hard Cover – anyday. I am yet to switch to e-books.